Since Steve Jobs announced he was to step down as the CEO of Apple, the media has been talking to those close to him to analyse how the company will perform now that its co-founder and former leader is no longer running the company. Bloomberg spoke with Marc Benioff, chief executive officer of Salesforce.com Inc, who has had a close relationship with Jobs in the past, who revealed that the Apple co-founder had such a profound effect on him that he decided to “gift” the rights to the domain and sign over trademark ownership of the term “App Store” when Apple launched its own smartphone application market. Benioff explained that when he and a number of his team visited Jobs at Apple in 2003, the (then) Apple CEO told him that whilst he had a “fantastic enterprise application”, he would need to build an ecosystem. The Salesforce CEO and his executive team took the advice, not knowing really what they needed to do at the time, and came up with an idea, an enterprise “App Store” which was launched under the name “App Exchange”. However, Benioff liked the name so much that he trademarked the term and bought the domain. 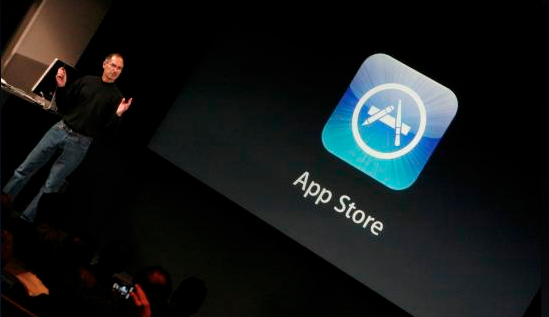 It was only when Apple (and Jobs) introduced the App Store on the iPhone that the Salesforce chief decided he needed to do something about the term and the domain, now that the Cupertino-based company was using it. Apple were given the rights to the domain and the trademark, something it now uses against Amazon and fights Microsoft over in the courts. It’s another fascinating story from the Jobs era, one that shows a more personable side to the technology industry where similar examples are difficult to find.